Numerous pieces are involved in the email marketing puzzle. Some are not even related to your marketing campaign at all, but more about how you respond to emails you receive. For example auto responders are services you can use to help you once you launch a marketing campaign. You also have other services that can be used for launching your marketing campaign. This email technology is all about online services that allow you to draft, send, and set up future email campaigns. Take a moment to learn how it works. Lettermelater.com, Gmail, Yahoo, and nearly any email technology can be used to send an email at a later date. It is possible to set up a specific date, so that you can write your next email campaign, newsletter, or email post when it is convenient for you. Sometimes you do not have a moment to set up an email to send right now. You may need to set it up a week earlier when you have a moment to do so. With many software programs out there to choose from you will need to decide what works best for you. Gmail is not going to draft the email campaign for you. You will need to draft it based on your ideas. You can use Word to create it and then copy and paste or write it in the email. In either situation you may not have the best format. There are services like lettermelater.com (this is only an example and not something being sold or tested). This service helps you generate an email campaign to send at a later date. It allows you to formulate the look of the email right down to HTML for the text and pictures so it appears nice and business like. Technology like the example can be found from a dozen different companies. You not only write what you want to say in a template, but then you set it up for a different time. 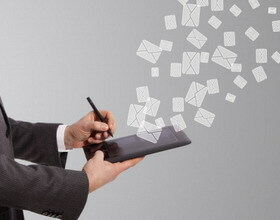 There is more to the technology than just writing the email, making it look business like, and sending it later. It is a fully functional management program for email marketing and newsletters. Every time you get a response from the email campaign you send out it will help you keep track of the clients responding. Additionally, when someone contacts you it is possible to add their name into the software so they start receiving your emails. You are able to put an opt-out at the bottom too. This type of technology is a full email marketing campaign set up. It does more than a regular email service. Gmail can offer auto response, add people to contacts, and send out emails. However, unless you use a combination of services you won’t be able to draft your email based on helpful tips and formats. You also may find a limit to the amount of people you can select or send to when using a regular email service. It is important to draft a message that will be important to the client you are emailing. Sometimes a business has more than one target audience. With proper technology it may be possible to create groups. For example many of the services like the above example help you create marketing groups. Say you own a dive resort. You may have guests who stayed with you before. You will want to reward them for their stay with a different email marketing campaign than someone who came to your site and signed up for newsletters. By establishing groups in the email you can use one click and send out the email to the appropriate people and save time. Really this technology is all about how you can save time, remain professional, and appeal to your consumers with each email you send out.